More than one-fourth of all residential buildings in Europe date from before 1945. Over the past decade, preservationists have taken to the idea of renovating historic structures in an energy-efficient manner. The planned IEA SHC task titled Deep Renovation of Historic Buildings Towards Lowest Possible Energy Demand and CO2 Emission intends to find the best solutions to this challenge. 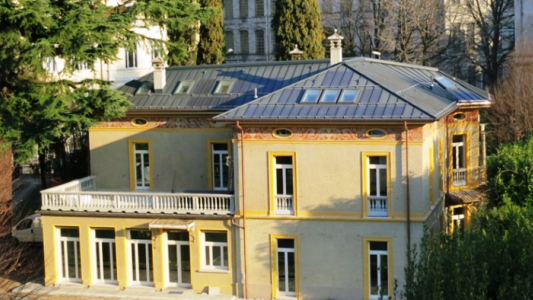 The photo shows the Villa Castelli at Lake Como in Italy. The energy requirements of the building have been reduced and the remaining demand has been met by a heat pump and PV-generated electricity. Participants from research, industry and consultancies based in 10 different countries have recently met for the second task definition workshop in Vienna, Austria. The task work plan has been finalised and is set for approval during the meeting of the executive committee in June 2017. The task itself is scheduled to start in autumn of 2017 and run until autumn of 2020. Its members are said to cooperate with the participants of IEA’s Energy in Buildings and Communities Programme, as the topics of both projects are related. Troi intends to work with a multidisciplinary team consisting of technical experts, architects and conservation specialists. This multifaceted approach is a prerequisite for incorporating a view from all disciplines into the planning process. The objective of the new task is to develop and implement a replicable workflow detailing how experts can work together to find an integrated solution which also adheres to the standards specified in EN 16883. A knowledge base, which stakeholders can browse to find inspiration, implemented as a searchable online database listing successful case studies. It will reportedly also include the results and expertise of two completed research projects: Task 37 (Advanced Housing Renovation with Solar and Conservation, July 2006 to June 2010) and Task 47 (Solar Renovation of Non-Residential Buildings, January 2011 to June 2014). An overview of retrofit strategies compatible with proper building conservation and focused on providing solar solutions. This list is to include decision criteria and replicability assessments. Use of the opportunities presented by the biannual International Conference on Energy Efficiency and Comfort of Historic Buildings in 2018 and 2020 to guarantee the widespread dissemination of results. There, Troi and her team could take advantage of the dedicated sessions and workshops to establish a platform for presenting the outcomes of the task. The other partners of the project are e-sieben (Austria), Uppsala University (Sweden), the University of Innsbruck (Austria), Historic Environment Scotland (UK), KU Leuven (Belgium), the Belgian Building Research Institute, Politecnico di Milano (Italy), Tecnalia (Spain), CUPA Innovación (Spain), the Danish Building Research Institute, both the Fraunhofer Institute for Building Physics and the Institute for Solar Energy Systems (Germany), SUPSI (Switzerland), the International Scientific Committee on Energy and Sustainability (ICOMOS ISCES via ICOMOS Ireland) and Victoria University of Wellington (New Zealand).